pieces=wenge & oak. Tray= mahogany & zebra. A very nice pack problem.I had it in my drawer for a long time.Its with triangular pieces dissimilar and non symmetrical with one solution. It is serially inside or outside the tray.It has 3 layers.None of my friends have done it,although when i designed it I did not think it would be that hard.What I think is that we are not so familiar with triangular shapes compare cubic shapes.Its there and you dont see it. 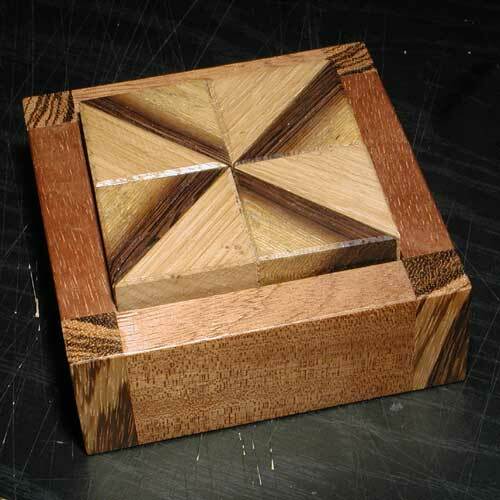 See more pics of the "7PN" puzzle.or Back to puzzle index.